Whether a path is being considered as a part of a whole new garden, or whether you see one little opportunity to add a path to an existing garden, I share with you, my considerations for the purpose of a garden path, and my little rule book. Only build a path where people are naturally going to walk. Normally, this is in a straight line, or in a wide sweeping curve. There needs to be a reason to walk the path – i.e. to the car, or to a point of interest, (example would be a seat), within the garden. People naturally cut across awkward corners, or not bother to use a path that does not lead to a useful place. What surface is required for the anticipated traffic? Be practical about the amount of foot traffic expected on the surface. If the path will be used daily, to move shopping, prams or children’s equipment, the most sensible choice might be a solid paving or concrete. If it is a minor path to a small garden seat, stepping stones in gravel, or a decked surface might serve a more aesthetic purpose. The width of this path was guided by the entry pillars, and provided a suitable entry width to this residence. What material choice will look best? Refer to your existing surfaces, or other material decisions to make this decision. A path isn’t a highlight within a garden. It should look as though it is meant to be, and integrated into other decisions. If you already have a main, solid, paved path, a minor path could be the same paver material, set in gravel, lawn, or a groundcover. Natural bluestone paving, or steppers can look great in many situations. This pedestrian entry path will not be used on a daily basis, and the driveway will be the main access for vehicles and bicycles. 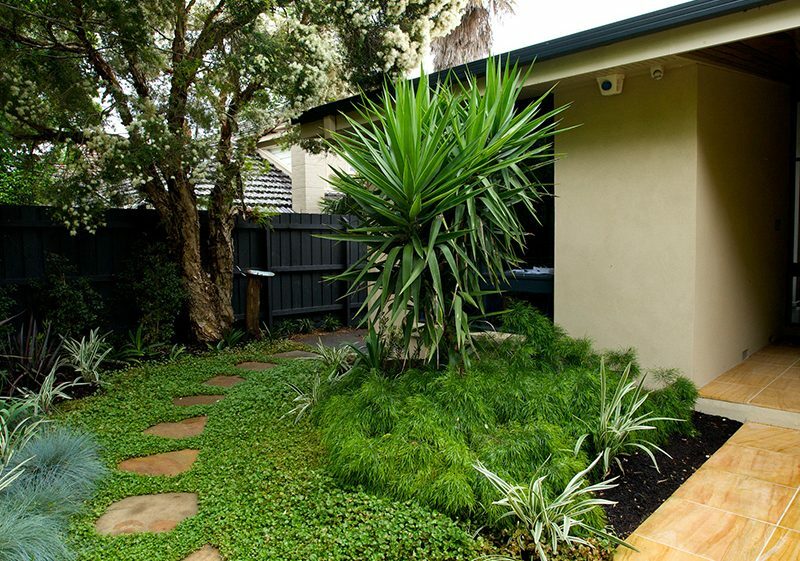 A bluestone stepping stone pedestrian path through lawn was a soft touch to this 1950’s weatherboard. How wide should my path be? A wide, solid sandstone paver to the front door provides practical purpose whilst a complementary natural sandstone stepper pathway provides a minor path. The economics of a path, now and into the future. There are many times and places where a simple, inexpensive gravel path is the right choice. They can be perfect for creating a minor path, or adding to a country atmosphere. Be mindful however that over time, they may require further compaction, top dressing and not respond well to heavy downpours. Similarly, groundcovers grown between pavers can be a softer addition to a path but require irrigation and maintenance. Exposed concrete and solid paving might be the more expensive option at the outset, but built correctly, they become a set and forget asset to your property. Again, there is not a right decision but another consideration in the many thoughts that arise when you make a decision to add a path within your garden. Stepping stone pathways, where appropriate, are often an inexpensive choice. Some maintenance, weeding and water supply is required to keep groundcovers (dichondra repens) growing well between these steppers. Another stepping stone example for a minor path (recycled sleepers). The mulched finish between these pavers may be suitable for a minor path, but if used regularly, mulch may tread from foot to other pathways. This article considers my personal preferences for pathways. I have developed these ideas from my design courses, work experiences, and review and follow up of different projects. I have not touched upon some feng-shui principles of a garden and pathways, which I also know to be important for some people. Perhaps you have an idea for a garden path at your house? Feel free to contact Brendan on 0411 660 855 to discuss, or seek a quotation.